This book is part of the Cambridge Life Skills Project. It is one of 12 titles in the Big Book Little Library Health Project. This title focuses on home safety and highlights the many dangers small children face in the home. When the family is too busy to play with Jake he finds a key and tries to put it into a wall socket. His Mum is just in time to save him. He hides under the table, but gets bored when no one finds him and he pulls on the tablecloth nearly spilling the hot tea over him. While playing with a plastic bag he tries to put it over his head, but his Father sees him in time to prevent him suffocating. Grandma finds him about to eat her pills, thinking they are sweets, and his brother snatches a bottle of bleach from him before he can drink it. His father decides to put Jake in a playpen to keep him safe. But Jake thinks the family should make the home safe for him to play. The books in this project were all workshopped with children before being accepted for publication. "This story captured the children's imagination. They pre-empted the result of each of Jake's actions and began to say "Oh, no!" in advance of the tester reading it. They also called out "No, he'll die!" or whatever the appropriate response was to a particular action. 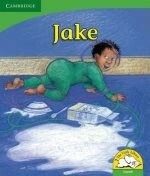 The children laughed with relief every time Jake was 'saved'. At the end of the story, one boy said very strongly "This story is not for children. It should be for the mothers and fathers. They should take the responsibility." The other children all agreed. They discusse all the issues inherent in the story and told their own 'horror' stories related to to those in the text e.g. those who had siblings who had burnt themsleves or drunk paraffin etc. The children enjoyed he text and the illustrations. It was a popular choice for both boys and girls during the group discussion." "The children loved this story. They were wised up on the horrors that were potentially about to befall Jake on each page. They responded verbally and one or two of them even covered their eyes when he was about to pull the plastic bag over his head. They knew words such as 'electrocuted', 'shock', suffocate' and 'poison' (but they didn't know what paraffin was). They were relieved each time Jake was 'saved'. They felt that the issue of a child-friendly home was important and that parents should 'know these things'. Most of them believed that their own homes were safe and that their parents had taught them well about possible dangers in the world. They said the story was important for 'silly people' who don't know about home safety. They were sad that Jake ended up in the playpen when the adults in the story should have been punished instead." Nobody will play with baby Jake. "I know," thinks Jake. "I'll play with this key." "I'll poke it into one of these holes in the wall."